Michelle Corfield from the Ucluelet First Nation is running as a Liberal and, chosen March 30, Bob Chamberlin of the Kwikwasutinuxw Haxwa’mis First Nation, is running for the NDP in the Nanaimo-Ladysmith riding federal by-election May 6. 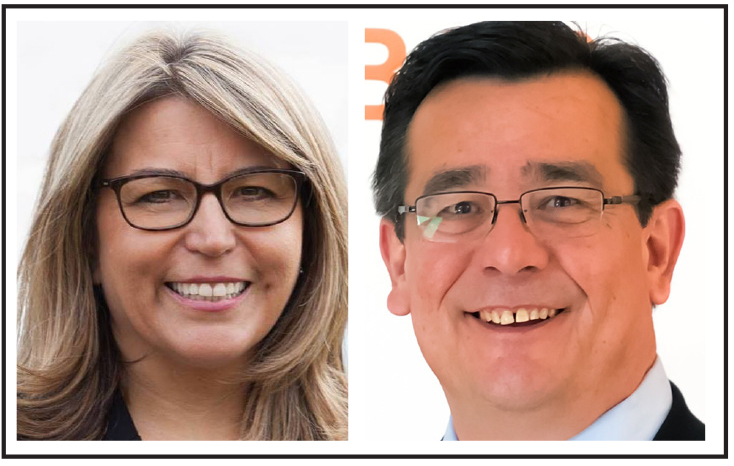 Two Indigenous candidates will face off in the Nanaimo–Ladysmith riding in the May 6 federal by-election now that Union of British Columbia Indian Chiefs vice-president Bob Chamberlin has won the NDP nomination. On March 30 Chamberlin earned a first ballot victory defeating three others vying to replace former NDP MP Sheila Malcolmson. Malcolmson stepped down to pursue provincial politics. Chamberlin, who is from the Kwikwasutinuxw Haxwa’mis First Nation, will be challenging four others for the position of MP, including Michelle Corfield, who won the Liberal nomination March 16. Corfield is a member of the Ucluelet First Nation. Chamberlin said the fact that two Indigenous people are running in the same riding is a sign of the evolution of the country. “The struggle of First Nations people is well known by our people, but it’s becoming more of a (issue) that needs to be dealt with for this country to be all that it can be,” he said. He points out that the three candidates he ran against for the nomination underscored the NDP as a party for the people: one candidate identified with the LGBTQ community, another was a health worker, and another was a businessman. He also points to the embattled Trudeau as a concern for Indigenous voters. “What’s going on right now with the Prime Minister and Jody Wilson-Raybould (another Indigenous person in federal politics), it certainly shows the government in utter disarray and certainly the image that was sold during the last election has come off and is lying at the side of the road,” he said. Chamberlin says he has much to offer as the new MP and points to his nine years with the UBCIC for the experience he has gained with both provincial and federal governments. He says being on the UBCIC executive has taught him to “distill down mandates” to understand the shifting priorities. It’s given him the ability to listen, and to understand the importance of engaging with the people on a regular basis. “Regular engagements are critical for the success of an MP because you have to be able to be in tune with your riding to seek out, create and capitalize on opportunities to meet the needs,” he said. Whoever wins the by-election will get six months in Ottawa before all Canadians go to the polls in October. Chamberlin says he would make the most of those six months. “It’s about getting in and being effective immediately and that’s where the broad base of experience and understanding of the function and issues at the national level, this is where I can hit the ground running.” He said. Joining Chamberlin and Corfield as candidates in the Nanaimo-Ladysmith riding are John Hirst for the Conservative Party, Paul Manly for the Green Party, and Jennifer Clarke for the People’s Party.